A newer member of the Stockton family, Adeline Koh, ran a session on digital scholarship that was equally interesting and very engaging. Being off of the tenure track, and not at a university, I had a different perspective than some others brought to it. Others like Amanda French, who aren’t teaching right now, brought a unique perspective as well. Ulyssesseen.com is an app for Ulysses. Cool. 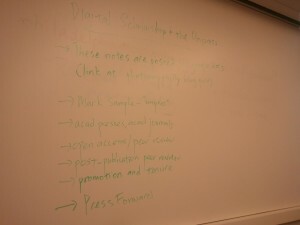 Big question about whether digital publications count towards tenure. Kathleen Fitzpatrick’s Planned Obselence and Shakespeare Quarterly’s move to open peer review are brought up. Deb Gussman asks for a definition of what “open access” means. Cost and institutional support are important. 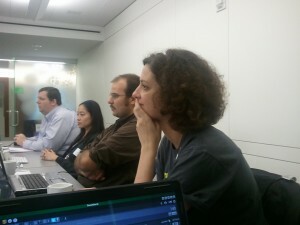 Siobhan Phillips asks about differences in cost between open and closed peer review. How much worth do you get out of a two year process for a scholarly journal? Amanda French asks at what point in the process should peer review come in? Creating an epub is so easy now. I need to create an epub/mobi of my MA thesis. Amanda also mentioned Press Forward. Siobhan Phillips had a great idea about having organizations in various fields creating open access bibliographies. Discipline loyalties are more important than institutional loyalties. Because I am not on tenure track, I definitely have different relationships to these issues than others in the room. I mentioned that I don’t feel comfortable publishing in something that couldn’t easily be accessed by my grandparents and there was definitely some amused looks. Whatever. I’d rather people have access to my work than worry about being “legitimate” or whatever. Gussman wonders if outside tenure review can be applied to peer review? Digital Humanities Quarterly already does I believe. Amanda and I discussed the impact of self published or open access published works. We both get comments, emails, and know where readers are coming from. Janine Utell: Decide what your career could look like and make best case you can. Adeline's notes on the white board. 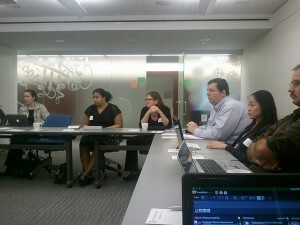 A good shot of some of the room including Siobhan, Deb, Adeline, and my TweetDeck. Amanda and Adeline listen to Janine Utell speak near the end of the session.